"There is no rule that he won't break if he thinks it will help his candidate." Theaters and DVD shelves are flush with political documentaries in this campaign season, and this latest is clearly designed as red meat for blue staters. 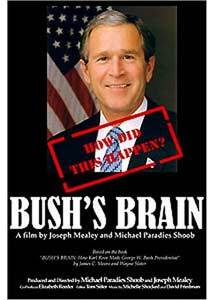 It's a movie that�s candid about its politics from the jump, and its contempt for our President—we see George W. Bush in various situations with the trappings of the Presidency, followed by an incredulous title card: "How did this happen?" The operating hypothesis here is that the organ of the film's title is Karl Rove, the President's Chief of Staff, and though the film succeeds in portraying him as dishonest, slimy, and ruthless, it doesn't come up with the proverbial smoking gun, nor does it separate him out from the moral cesspool that is so much of our national politics. Rove may be a particularly unsavory sort, but in truth (here, anyway) he doesn't seem qualitatively that different from other cutthroat politicians. The film is based on a book of the same name, by James Moore and Wayne Slater, two Texas newspaper reporters who covered Bush long before he became President; both are interviewed extensively here. (Slater will be familiar to my fellow dOc political junkies from Journeys with George, in which he was the amiable, cynical elder statesman of the press corps during Bush�s 2000 Presidential campaign; the White House years seem to have pushed him from skepticism to cynicism, and it's hard to blame him.) Karl's political highjinks began early, as the film documents; in 1973, he threw one of his best buddies under the truck to be certain that he, Rove, would be elected the leader of the national college Republicans. Rove is portrayed as a Lone Star State Machiavelli, willing to do whatever it takes to win—this includes allegations that he bugged his own office in a 1986 campaign, to stanch the bleeding of his own candidate's poll numbers, and even having some of his political opponents thrown in jail, for charges that seem like pretty standard operating procedure in Texas state politics. And just as the boy is father to the man, the patterns established in the early years are the ones we've seen played out on the national stage. The whispering campaign against John Kerry this fall (Didn't he kill babies in Vietnam?) looks a whole lot like the one against John McCain during the 2000 South Carolina Presidential primary (Isn't McCain too unstable, a Manchurian candidate, and doesn't he have an illegitimate child with a black prostitute? ), and the one against Ann Richards in the 1994 gubernatorial race (Isn't she a lesbian?). Some of the political takedowns are even more current: the film features interviews with former Senator Max Cleland, a Vietnam veteran who lost three limbs to a grenade, and then got compared to Osama bin Laden and Saddam Hussein by a Rove acolyte in his re-election bid; and Joseph Wilson, a former ambassador whose wife was outed as a covert CIA agent after Wilson published a piece that didn't tow the party line on weapons of mass destruction in Iraq. Audio Transfer Review: Some hinky things are going on in the audio transfer, too, with weird, echoey effects and lots of static. The technical elements of this disc are pretty weak. Extras Review: An original trailer features a portrait of Dubya morphing into Rove; pretty funny, actually. The Republicans Speak (06m:54s) features many of the same guys in the feature; a deleted scene, Old Friends (04m:00s) addresses Rove�s time on the faculty of the University of Texas (Hook 'em, Horns! ), and makes the point that, in Karl's America, "dissent has become a form of sedition." There's also an Easter egg—click on Rove's eyeglasses on the main menu, and you'll get to Impressions of George W. Bush and Karl Rove (15m:17s), more footage with the same cast of characters; best of all is Molly Ivins' assessment of the holy trinity of Texas politics: religiosity, anti-intellectualism, and machismo. The stars at night glow big and bright (clap clap clap clap) deep in the heart of Texas. A hatchet job on Karl Rove, that unfortunately throws off mostly splinters. Rove seems like an odious guy who has done lots of icky things, but the documentary doesn't quite deliver the goods; the film interviews a lot of journalists, and we're asked to take their word for it. Whether you do or not is probably a pretty accurate reflection of who you plan to vote for in November.